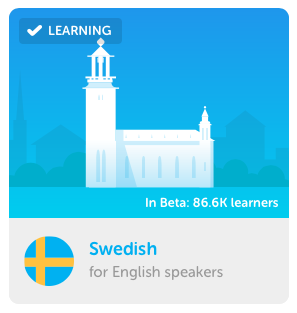 Duolingo Releases Swedish in Beta! Duolingo, the free, popular language learning application for desktop and mobile has now released its Swedish for English speakers course in beta! I’ve spent the last few days working with the app on desktop (mobile is not released until it is out of beta), and I really enjoy the course. For those looking for a fun, simple, and actually useful learning solution, I definitely recommend Duolingo over any other course I have used – exceptionally useful for vocabulary expansion. If you are just starting out learning Swedish, or are well into your Swedish studies, Duolingo accommodates all levels of learning. Check it out today and sign up now (everything is completely free)! Learning Swedish has never been more easier.